My dad and grandad were both keen anglers, and from the age of three I was always on the bankside and loved fishing with them. In fact, the first picture in my scrapbook is me crawling around in a keepnet at just a couple of years old. I spent lots of time at my nan and grandad’s caravan in the small village of Torksey in Lincolnshire. The River Trent, Fossdyke Navigation and dozens of stillwaters were nearby, and my grandad, Ray, took me fishing throughout the summer holidays as a schoolboy. What is your biggest fish? Weighed, it was a pike at just over 20lb, caught from the Foss Dyke Navigation when I was about nine years old. I’m sure I’ve caught some carp a little bigger than that at match venues, but never weighed them! How did you get in to match fishing? I attended a fun open-day that was hosted at a fishery local to me in Shireoaks. The Worksop & District Anglers Association, who had a thriving junior angling setup, organized it. The manager of the cadet squad, Glynn Williams, saw me fishing and asked if I wanted to join the squad as a trainee. I was too young to fish any of the matches at the time at only eight years old. However, I went along to all the practice sessions, and fished my first national as soon as I was old enough at ten. We won as a team and I managed third overall – I was proverbially hooked! From there, I progressed through the cadet and junior ranks. I also fished quite a few club and open matches from being around 12 years old. My local village club, Wales and Kiveton Park Angling, had matches in the local area, and I loved all the banter and craic! I still used to travel down to Lincolnshire too, where I fished matches with my grandad’s club, the White Swan Angling Club. At 13 years of age, I was picked up by Alex Mitchell – a former Barnsley Blacks angler who now owns Aston Park Fishery, and Richard Littlewood, a local angler who picked me up to go to local matches. They suggested I fished more senior matches, and I began fishing with the Worksop senior squad. I managed to fish the last few years of the old Angling Times Winter League with them, and learned loads! I entered my first trials for the Junior England squad at 13, which was a fantastic learning experience although I didn’t get in. The following year, I attended the trials again at Furzton Lake. My dad arranged for Alex to come practicing with us, and he showed me some fantastic tricks for catching big roach that I still use these days. That year I made the squad that would travel out the World Championship in Serbia. We won team gold, and I was crowned World Champion – it was surreal. I always wonder about fate though. If my dad hadn’t asked Alex to come down for a practice, I may not have caught fish on those trials, and could have easily been left out of the squad. I’m honored to have been involved in international fishing with England to this day since then. After fishing some matches on the Stainforth & Keadby Canal, I joined a team known as Triana North – now Sensas North. I had a great couple of years with these lads, fishing some big matches on challenging venues like the New Junction Canal, River Aire and River Nene in a Winter League Final, against excellent anglers and teams like the Barnsley Blacks. At 18 years old, I was asked to join Barnsley. Rubbing shoulders with the likes of Dennis White, Alan Scotthorne, and Lee Kerry to name just three was amazing, and I’m still with this team now. What is your biggest weight of fish? Last year, I caught 314lb in the David Hall Memorial match, which took place at The Glebe Fishery in Leicestershire. I didn’t know how much I had in each net after two hours, so I put five keepnets in and kept putting a fish in each one to make sure I didn’t go over! What is your favourite venue, and why? Definitely the Stainforth & Keadby Canal at Thorne. I’ve been fishing it for years, and you always get loads and loads of bites! It’s also incredibly fair in matches, and the winning tactics change year after year. Mastering the key principles of feeding and presentation is essential on this venue, and you learn loads that you can apply elsewhere by fishing there. What team do you fish for? Can you name the best fishing trip you have ever been on? I could name dozens! I’ll pick a more recent one though – last years World Club Championship on the River Vah in Zilina, Slovakia. The river was like nothing I’ve ever imagined – it looked unfishable! Evil boulders made up the banks, and you needed a 50 gram flat float to run a bait through the swim! After the first day at the venue, I’ve never felt so out of my depth – I was mind boggled. However, as the week progressed, we learned more and more as a team, and come the end of the week we had a method and plan. When you hooked a fish in the flow, it was like hooking a train, and I’ve never put my tackle under so much strain before. I managed to win my section on the first day, and was fourth the next, with the team getting a bronze medal. Although we didn’t win, if felt like we did on such an alien venue. Who are your angling hero’s? I have several, but at the top without doubt are my dad and grandad, all my family infact - I have so much to thank them for! They took me fishing on the snowiest, glum days after they’d had a bad week at work, traveled the length and breadth of the country and now world, kitted out their garage for my fishing gear, I’m incredibly lucky to have had their support to this day. Glynn Williams is another. He really took me under his wing as a child, and welcomed me into the competitive side of the sport at just eight with the Worksop Juniors, as he did so many others – a proper gent who taught me a lot about fishing. I have a lot to thank Alex Mitchell for. He was awesome at fishing, and showed me things ten years ago that top anglers do now – he taught me loads! I’ve got to say Alan Scotthorne too. I remember listening to him at an open evening we had with the Worksop Juniors when I was nine. I was in awe. He seemed to know so much mind-boggling stuff about fishing. Since, I’ve fished against him, and now fish with him in the same team. It’s making my spine tingle as I write this bit. I still hang on to every word he says, and can’t comprehend that he was amazing when I was a mere child, is still incredible now, and I’m lucky enough to fish alongside him. Really, it shows that anyone can achieve their goals in angling if they have the drive. In terms of younger hero’s, Tom Scholey and Lee Kerry too. I spend more time with Tom than anyone, and he’s not only shared some fantastic angling experiences with me, but lead me into angling as a trade, and taught me invaluable life lessons. I wouldn’t be sat here writing this if it wasn’t for Tom - he really is my best friend. Lee Kerry has given me a more recent streak of drive and enthusiasm. He takes it to the next level, and has unbelievable amounts of energy all the time. We talk about fishing all the time, he’s taught me loads, and together we analyse things to the limit – in my opinion, all this definitely makes you a better angler! 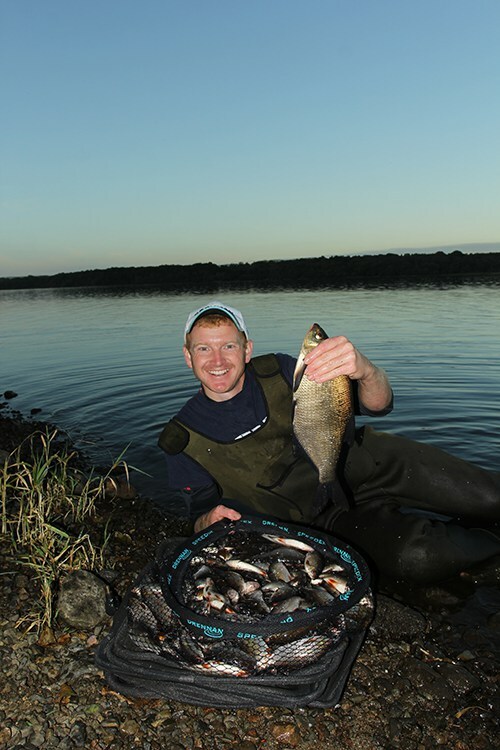 Do you have any other sports or interests outside angling? I do some modeling for male lingerie manufacturers, and take part in some mild adult films…haha, only joking! I like running keeping active, and also love outdoors and geography. I did a degree in it, and have always loved landscapes and the environment. I sometimes go off on a big rant about space and how amazing the world is – I’m probably quite weird actually! What is your biggest angling achievement? Winning three junior world championships was incredible. Not just the winning, but the experience and amazing times I had throughout it all.